As identity politics makes the group paramount, rather than the individual, readers of today’s Australian should be grateful for the subeditor who helpfully identified Moutia Elzahead as the black sack on the left. 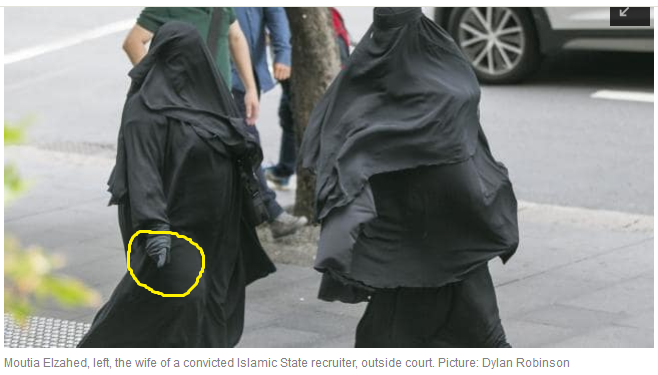 Worth noticing as well is Ms Elzahad’s extended index finger (circled), the ISIS salute. Ain’t multiculturalism just grand! Those who subscribe to The Australian can follow this link or the one below to learn how, while we are told all cultures are equal, there is one whose antics aren’t quite so valued in the courtroom of NSW District Court Judge Audrey Balla.